I'm ready to: Subscribe Now! Simply Enter your Email Below And 'We'll Send you A Free Copy! No Credit Card Needed, Enjoy!! Is there a catch to the Free Issue? No credit card or hidden catch. The RPA® offers new landlord subscribers the opportunity to try one issue for free before buying. All you need to do is provide your first name and email address, then we'll send you the next issue completely free with no strings attached. Then, if you choose to continue your subscription, come back and subscribe. Go ahead, try it before you buy. We think you will like it. An eZine is a digital version of a magazine. You will need to have a valid email address to receive your subscription. A link to download the eZine will be sent to you every publish date. In the future, the RPA® may make a print version. Today the magazine is only available in digital format and requires subscribers to provide a valid email address. Subscribing to real estate magazine articles is a great idea for anyone dealing within the rental industry. This real estate news magazine is loaded with helpful landlord ideas, landlord advice, and landlord articles. Landlord- the Magazine! is a unique multifamily trade magazine; unlike real estate news papers our real estate magazine articles are interactive allowing you to network with other landlords online to discuss articles, local issues, or even new ideas. Although this isn't a free real estate trade magazine, it�s a must for every Landlord! Why is this eZine helpful? The RPA® is very capable of discovering real estate trends and problems facing landlords, due to our vast complaint records. Complaints are a good indications of trends and avoidable problems. To show an example the RPA® quickly became aware of bed bug infestations well before most of the nation realized there was a problem, how? Because there was a steadily increase in Bed Bug Complaints against landlords. Today, the second most common complaint handled by the RPA® is bed bugs, the first being deposit disputes. Due to the sharp increase in complaints the RPA® was able to educate our subscribers as to the problems surrounding bed bug infestations, how to identify bed bugs, and how to properly eradicate bed bugs. This type of knowledge has saved countless landlords from lawsuits or expensive extermination costs. Most likely, the RPA® was one of the first landlord publications to write up on bed bug problems. Today, the RPA® provides a bed bug free certification program. Landlord the magazine comes out every 3 months / 4 times a year. Future plans include more issues, but currently it is delivered digitally every quarter. What types of articles are covered in each issue? Articles are carefully considered based upon their impact to the multifamily rental industry. Tips, trends, ideas and tools are commonly found within the ezine. The RPA® also welcomes suggestions or ideas from our subscribers. 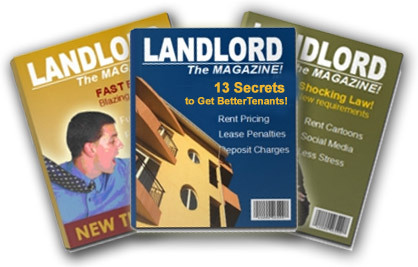 The premise of the magazine is to educate, inform, and provide money saving ideas that can help all levels of landlords. Is my subscription really 100% tax deductible? Yes! The full cost of the subscription can and should be deducted as a business expense. To subscribe, you can either click on the "Subscribe Now!" link at the top of the page, or you can provide your name and email to try a free issue first. Yes! Just provide the email address and name of the recipient and pay like you normally would. You are also welcome to send a free issue by providing their name and email address in the "Free Issue" section.